This is the seventh installment in a series about a book I'm reading called Stories Done, which is a great collection of tales of excess from counter-culture leaders. The Beatles came far closer to disbanding after their final 1966 tour than was generally known. George Harrison saw the group's massive popularity as a weight and a danger. He told manager Brian Epstein that he was quitting and left for a five-week sitar retreat in India with his wife. John Lennon was feeling adrift during this time and dropped to his knees to pray for God to tell him what he should be doing with his life. Paul McCartney, however, kept working and was enamored of the long, fanciful names gracing several American psychedelic bands such as Big Brother and the Holding Company and the West Coast Pop Art Experimental Band. McCartney wrote Sgt. 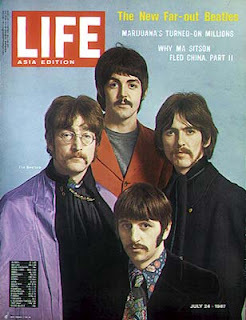 Pepper's title track and presented it, and his make-believe scenario for the album, to a skeptical Harrison and Lennon. In later years, all the Beatles but McCartney would distance themselves from Sgt Pepper's in some way or another. Much of their disgust stemmed from the way McCartney governed the band during this time (although, to Paul's credit, if he wouldn't have governed, the Beatles almost surely would have dissolved before much of their best work was released). But also, Harrison and Ringo Starr felt underused during the sessions (despite none of the other Beatles playing on Harrison's track "Within You Without You") and Lennon was, frankly, a little gone on LSD. Whatever the individual Beatles thought, Sgt. Pepper's Lonely Hearts Club Band is an almost-untouchable album. While Revolver and The White Album usually float to the top of my personal list, a recent listen confirmed for me that this is an album with nothing but 5-star songs (much like, surprisingly, Magical Mystery Tour). And I'm far from alone in thinking this: Brian Wilson of The Beach Boys pulled over his car onto the side of the road and cried when he first heard Sgt. Pepper's. He didn't finish his own epic, Smile, for 37 years because he was so upset that the Beatles had beat him to the perfect album. SPLHCB sits atop my personal rankings of Beatles albums and it isn't close. And that isn't a knock on Rubber Soul or White Album, the other possible candidates for best album, because they are phenomenal albums as well. But SPLHCB is epic on all fronts from studio innovations, album concept, poetic lyrics, visual imagery, timing of release, the peak of the psychedelic impact on the band, before the Ono splinter, the cool staches :), etc. Of course the same could be said about the White Album but IMO it just doesn't quite have the same mystique.